April's Spaghetti: simple, delicious comfort food. Yes, it's April Finger's turn to get a shout out on my food blog. I can't say enough good things about my wonderful friend April. She's beautiful on the inside and out, and when we get to heaven someday, I hope we get to be room mates. Not only is April one of my favorite people in the whole world, but she is also one of my favorite eating buddies. This is a recipe she introduced me to when "we all" lived in Portland, Oregon, and we only had each other for a while there. We spent a lot of time cooking and eating together. She is also the person who introduced me to "white girl enchiladas," which I'll have to make and post soon. 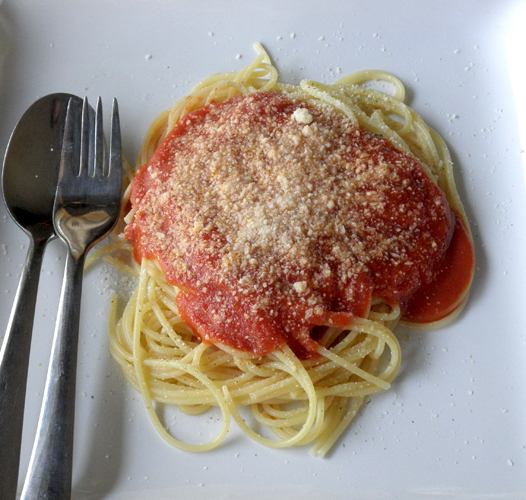 The beauty of this recipe is that it is so simple and uses ingredients most people have on hand: spaghetti noodles, plain canned tomato sauce, butter, and garlic salt (and Parmesan cheese, if desired). That's it. A quick, delicious meal, that I can only serve when my husband won't be eating with us (he's not much of a pasta fan). This recipe is not exact. Add more or less butter, as you like. After you make it once, you sort of see how it goes and how much gets eaten. To me, it's one of those meals you'll probably just make for you and your family, so you don't have to get it perfect. It's hard to mess up and tastes good no matter what. In a medium saucepan over medium-low heat, bring tomato sauce and butter to a simmer. Boil spaghetti noodles in salted water according to package instructions. Drain water when finished. Place some noodles on a plate and top with some sauce. Sprinkle with garlic salt, and Parmesan cheese, if desired.